NOTICE: The Air Buddy AB-2000 teamed up with the Storm Whistle makes the loudest whistle combination in the world for SCUBA divers for both above an d below the surface! This is the loudest signal device that can be easily carried by a scuba diver. 1. Notice that the Air Buddy in the picture is the AB-2000 because it has the gold ring. While the AB-911 can blow the whistle, only the AB-2000 and the AB-NX have the extra power needed to make this the loudest whistle combination in the world. 2. It blows above and below the water. 3. To blow the whistle, simply put the Air Buddy and the whistle together in a "kiss" position and squeeze the Air Buddy mouthpiece with your fingers. Be careful not to point it at your ears. It can be heard by a boat up to a half mile. This whistle is used by military forces and police departments all over the world. When blown with the mouth, as one would blow a common whistle, it is so much louder there is no way to describe it. List of users and test results. The air chamber was specially designed to magnify the sound. This whistle has no little "pea" ball inside as do common whistles. That "pea" will jam if a large volume of air is injected into a common whislte. The more air you put into this whistle the louder it gets. 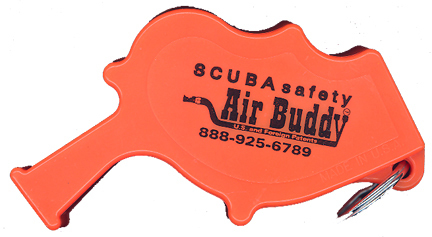 For that reason, we adapted it for use with the Air Buddy as the ultimage signal device for SCUBA divers. The Air Buddy will deliver an enourmous amount of air if the mouthpiece is squeezed. Simply placing the mouthpiece of the Air Buddy against the mouthpiece of the Storm Whistle will emit a blast that can be heard up to 1/2 mile away. That's the kind of signal you want if you want to get the attention of the dive boat while you are floating in the water trying to be located. It is much louder than any of the expensive air horns that are available on the power inflators of buoyancy compensators. 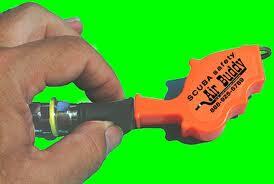 Also, because it has no "pea" inside, it can be used while submerged to signal your dive buddy. 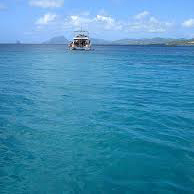 It is nowhere near as loud underwater, but it is sufficient to get attention when you need it. This would also be a great gift for your wife, daughter or girlfriend to carry on her key ring at all times.